Welcome to Native Art Traders, where contemporary Inuit Artists express a centuries-old artistic tradition. Where their work is so charged with imaginative energy , vitality and diversity. We are proud to present the work of many of the finest artists working in the Canadian Arctic today. All wallhangings, dolls, prints, traditional clothing and sculpture offered by Native Art Traders are of the highest quality. Each bears the 'igloo tag' certifying its authenticity as handmade by Inuit. Please call. Your knowledgable host, Eliot Waldman, welcomes you with open arms. Donald P. Jacobs, Dean Emeritus J.L. Kellogg School of Management, Northwestern University, Eliot Waldman and master carver Nuna Parr. 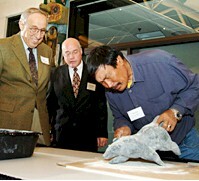 Mr. Parr is demonstrating carving a dancing bear at the James L. Allen Center, Northwestern University on September 16, 2005, Evanston Illinois. Art collector Eliot Waldman talks about the Inuit culture, customs, and art. This site designed and maintained by Levitan Technology Advocates.